Home BuzzIn Your app now speaks your language! “Nearly 60% of the people communicate in their native language” across India! During a typical day at RailYatri, we receive hundreds of email communications and telephonic conversations in regional languages. Furthermore, over the last year we have received thousands of feedback from our esteemed users requesting us to incorporate regional languages in the RailYatri app. So, we are glad to present the RailYatri app in a regional language of your choice. 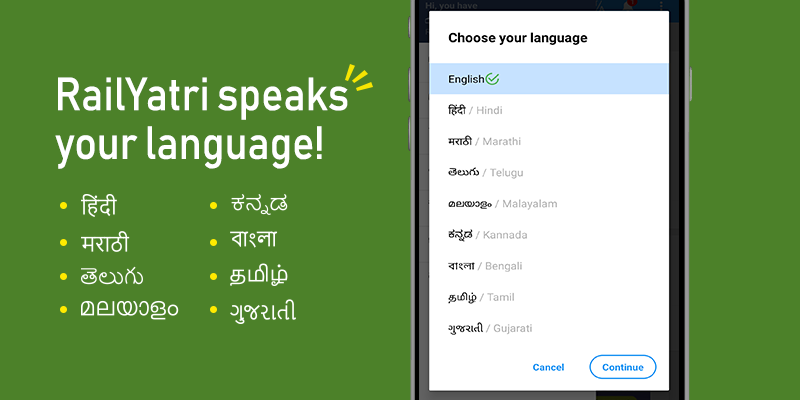 Now, you can access the app in 8 leading languages of India and of course in Angrezzi (English) as well. We understand the joy user’s experience while reading and communicating in their native language. It makes the process so much simpler! Today we are catering to millions of users across India, and it would be illogical to think that every user is equally adept at English or Hindi. Further, our app is not only accessed by users sitting in the mega cities of India, they are also accessed by people sitting in the Tier-II and III cities. We have to think about them as well. With the integration of 8 regional languages, now you can access information, view every button, field name, sections, etc. in a language you prefer. We have already translated the most popular sections of the app, and continue to add more regional information every day! How to change your default language? Choose your Language and its done! Choose your preferred language and click ‘Continue’. At RailYatri, we strive to bring a smile on your face each time you drop by. And we hope the hard work put in by our research, content and tech teams will delight you and encourage you to use the app more than ever. 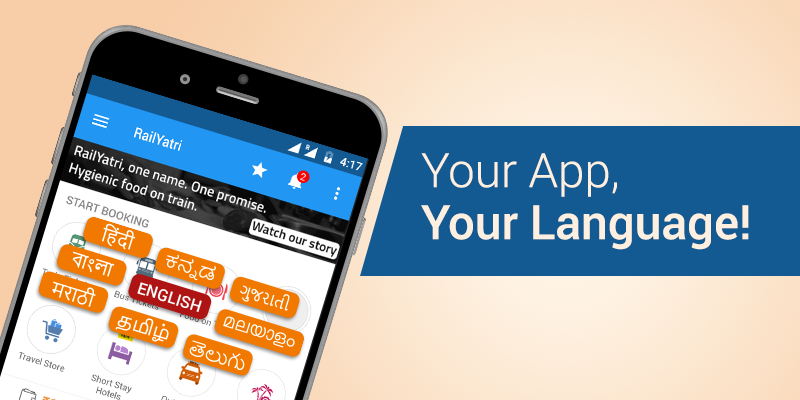 Do write back to us about how you like our regional language app. Previous articleGet 100% Refund on Ticket Cancellations with RY Cancellation Cover!